Well, I am wrapping up almost 7 years of re-building my TMI 22' and am almost ready to sell her. Over this last winter I made a nice replacement table in the salon and that was going to be the end of the table project. Until this spring when I really committed to selling. I recently decided to fit the table so the new owner can use it as such, if desired. I have a dumb question because I absolutely cannot find any photos of C22 cabins. it appears to me that the table, when raised, rests against the port hull interior; and a beefy pipe leg into the top and bottom brackets is all that holds it up. Is that true? If so, Do they work well that way? It seems to me that it would be a sturdier table if I make something in the hull to support the port side of the table. mine is stock and that's how it works (no side support). Very sturdy. Thanks much! I then think my next move is to find a piece of tube that fits snugly because none came with the boat. 1. I will sit in place, decide exactly how high I would like the table top and cut the post accordingly. Thanks again! I am going to miss (if the boat sells) chatting and getting really good help on this site. My next move is to build a 14' wood boat; one of John Welsford's designs. 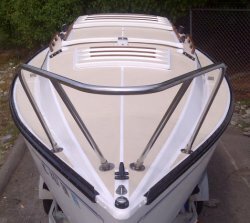 Careyr wrote: Well, I am wrapping up almost 7 years of re-building my TMI 22' and am almost ready to sell her. NICE!!!!! Thanks for posting those pictures! That is the neatest idea and I would most definitely copy that if I were keeping my boat!! 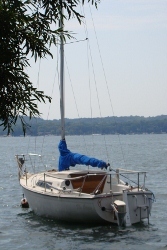 I keep doing things to the boat that I think a new owner would like and that one is REALLY tempting!!!!. I have gone to the store so many times at 50 bucks a visit that I am close to throwing caution to the wind and keep on doing nice things in the cabin because the hull has been made new already, mechanically.. It is so difficult for me to say when enough is enough. Although I've not sailed the boat much, I sailed her enough to know that this hull design is one of the best and most affordable, seaworthy designs a person can find. A person can re-furbish one of these (C22/TMI22) and count on them being good for another 40 years!